And I wanted to cook something special for my Mum, who has just discovered Swiss Chard, and my Dad who is just starting to get into greens. And seriously, when greens are this beautiful, how could you not want to cook with them? And so, it was time for pasta! 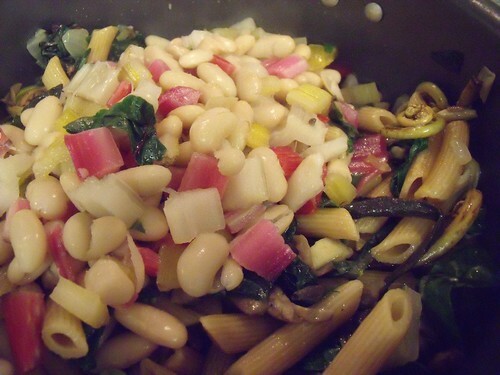 As you can see, my pasta dishes are usually more “stuff” than (whole wheat) pasta — alongside the mushrooms & the gorgeous chard (leaves AND stems, thank you very much), I included white cannellini beans, some lemon peel, and the aromatic base of onions and garlic. 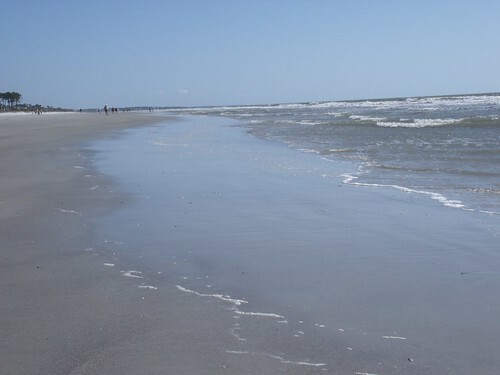 And just in case you also happen to be on vacation without your handy microplane or citrus zester, you can simply peel a lemon with a sharp vegetable peeler, and chop the slices. 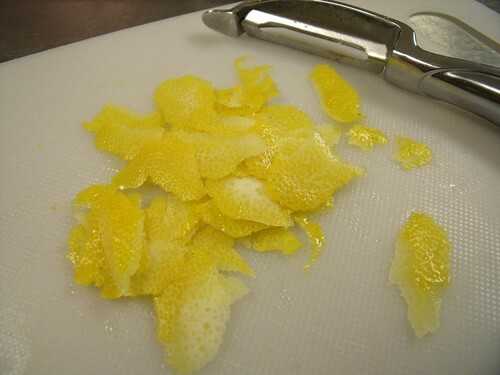 You get a bright burst of lemon oil this way from the peels — mmmm! And voila! A quick and nutritious pasta (20 minutes tops!) that is delicious and beautiful too! Bring a large pot of salted water to a boil, and cook pasta according to package directions. Drain and set aside once complete. Meanwhile, in a large pan, sweat the onions and garlic until translucent. Add mushrooms and sautee until tender. Add to the cooked pasta. 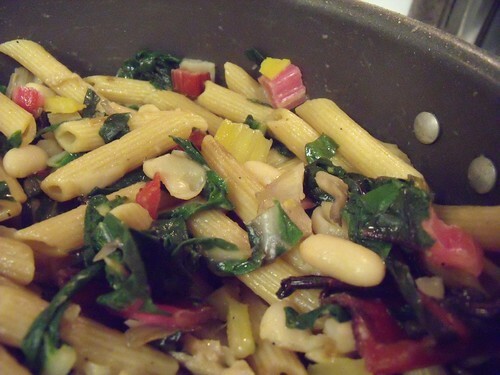 To the now-empty-but-with-a-bit-of-oil-leftover pan, add chopped chard stems, (optional white wine), and beans. Sautee until the chard is tender. 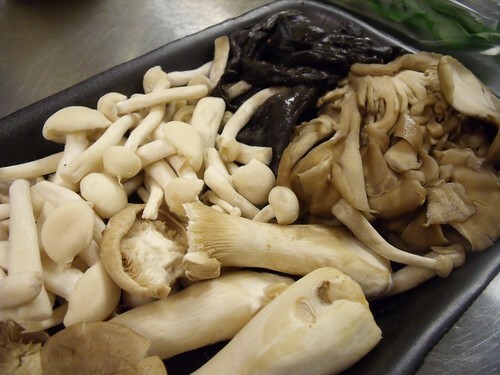 Add to the mushroom/pasta mixture. Now quickly cook the chopped chard leaves, just until they are bright green. Add to the mushroom/bean/pasta mixture, along with the lemon peel and juice. Serve while hot, adding the crumbled goat cheese over the individual plates. 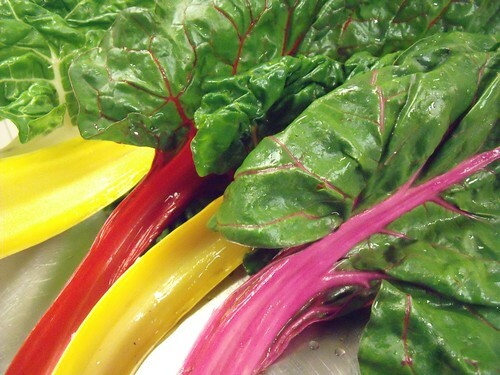 mmmmm, now THIS is something I will definitely try…I too have not had chard yet but this is a great introduction…thanks Linz!